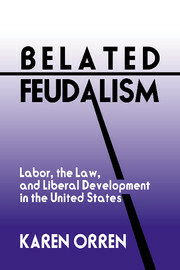 Contrary to the idea that the United States was liberal from its inception, Orren argues that both capitalism and constitutionalism proceeded upon a remnant of ancient feudalism. This was the common law of master and servant, embedded in the judiciary, cutting off the fundamental area of labor governance from democratic politics. The fully legislative polity that defines the modern liberal state was brought on through the industrial actions of trade unions in the late nineteenth and early twentieth centuries, and was established with the institutions of collective bargaining under the New Deal. The book represents a reinterpertation of American political development and of the role of the labor movement as a creator of liberalism, not a spoiler of socialism. Preface; 1. Introduction: liberalism and labor in developmental perspective; 2. The transition to liberalism and the remnant of American labor; 3. Belated feudalism: the order of the workplace in late-nineteenth-century America; 4. The old order and collective action; 5. Masters, servants, and the new American state; 6. Conclusion: the state of liberalism; Index.